Sreya Jayadeep singer profile and biography is given here. Sreya Jayadeep is a young singing sensation in the Malayalam movie industry. Before making her entry into the world of cinema, she showed her proficiency in singing by winning a reality show titled Surya Junior Singer. This reality show was aired by Surya television channel at the prime time. In fact, she was the youngest contestant in the reality show. The songs she rendered in the maiden movie Weeping Boy became a huge hit with the people. Sreya Jayadeep is the youngest music sensation to hit the music and entertainment industry by storm. In the year 2103, she was crowned as Surya Junior Singer at the tender age of six years. 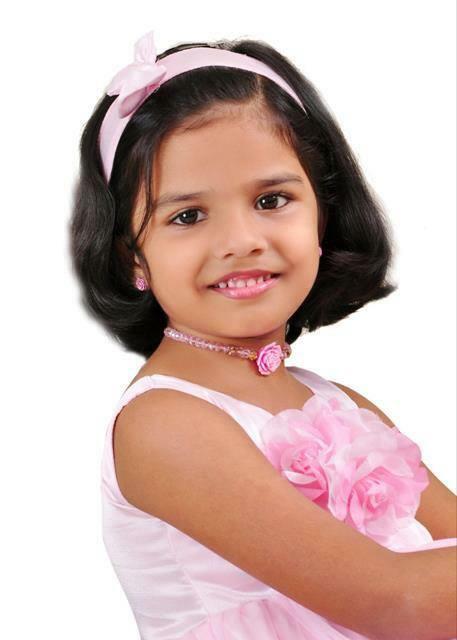 Right from the onset of the reality show Surya Junior Singer, she became the cynosure of everybody's eyes. When she was singing, she could exercise her hold on the nitty-gritty of Tala and Laya to impress the audience. Considering her tender age, she had the huge potential to become a successful singer in the Mollywood. This view was echoed by the celebrities and the reality show judges after witnessing the grand finale. Sreya Jayadeep is an upcoming music talent in the cultural arena of the state. She was born in the year 2007 to a Hindu family settled in Kozhikode. She is doing her formal education in a reputed school near her birthplace. Her talent in singing was noticed by her parents when she used to hum songs. She hummed songs when she was alone or feel bored. Her father Jayadeep decided to watch her closely to see what she was doing. After listening closely, he decided to bring some song-based books at home to enable her learn the lyrics and sing songs. With the help of these books, she started singing before a selected audience in her house and school. Her parents obtained same inputs from her school as well. At the tender age, she started singing in school programs and won the appreciations from her teachers and classmates. At home, Sreya Jayadeep never used to meet any music-based programs on different television channels. Looking at the interest, her parents decided to encourage her and give her all the possible help. At this point in time, both her parents and teachers happened to hear about an audition test being conducted at a local hotel in Kozhikode city for a reality show titled Surya Junior Singer. This music-based reality show was being planned to find the ultimate singing talent of the children coming under the age group of six to thirteen years. Having totally understood her potential in singing, her parents decided to send her bio-data and photographs to the organizers of this audition test. Along with the curriculum vitae and photographs, a compact disc containing her song rendition was also sent to the organizers. Sreya Jayadeep was promptly called for the audition test. So on the day of the audition, she went to the venue in accompaniment of her parents. As expected, young Sreya did well her audition test. She came out with flying colors in the test and impressed the judges at the venue. By evening on that day, the result of the audition test was declared public. Her parents were happy to know that their little angel was amongst the twenty children selected for the reality show. On the first day of the reality show Surya Junior Singer, she accompanied her parents to the studio to be with her friends who had been selected. At the venue, she interacted with other children, crew members and the judges. During the course of the interactions, the judges for the reality show gave certain advices and tips to the aspiring contestants. She started singing songs well right from the beginning of the show. According to the judges, she was the consistent performer who correctly imbibed the suggestions and corrections given by the judges. Hence, they were very happy with the kind of progress she was making at different stages of the reality show. During the course of the reality show, she consistently came in top 5, weathering the tough competition she faced from other contestants. Hence, she never reached the danger zone at any state of Surya Junior Singer reality show. When she reached the penultimate round, only eight contestants, including her, were remaining. Like other contestants, the tension was visible on Sreya's face. However, she had the destination clearly before her. To realize that, she kept on incorporating the suggestions given by the respected judges so that she could avoid the same mistakes in the subsequent rounds. All along the competition, her guru also pitched in to help her improve the songs in her arsenal. Her guru took classes or mock rounds to help her overcome the stress and handle questions posed by the respected judges. Because of her elaborate preparations, she could render some effective numbers before the judges to earn good points that helped her to stand in good stead. When the results for the penultimate stage was announced, she could get the direct passage to the grand finale. Five more top contestants followed her to the grand finale stage. Again Sreya Jayadeep struggled hard against time to perfect her rendition knowing fully well that she could win only when she sang well without making any mistake. Like before, her guru and other people helped her negotiate the stress by suitable stress busting techniques. As a result of these preparations, she could overcome the stage fear. She was not used to rendering songs before a huge audience. In the intervening time between winning the penultimate round and the grand finale, she toiled hard at singing, incorporating the corrections and suggestions given by the jury members. Moreover, the jury members personally oversaw the practice and gave them valuable suggestions and counselled them to overcome the stage fear. These preparations helped the contestants to give their best in them before the audience. When the D-day came, young Sreya chose a number that could fetch her good marks to stay ahead of the other contestants. Since she was well prepared, she rendered the song effectively, generating a positive climate. As a result of this, she got the positive reviews from the permanent and the invited judges. As soon as her song rendition was over, she got a huge applause from the audience spontaneously, indicating what was to come as an outcome. She waited for other participants to render their songs and heard them singing with apt attention. After having seen all the contestants singing the songs, she had a ray of hope that she would get some prize. When the result was announced, young Sreya was dumbfounded, as she was not expecting the first prize. She broke into tears of satisfaction, joy and bewilderment. She stood first in the reality show. This helped her earn Rs. 10 lakhs and a chance to sing songs in a movie. The winning of the reality show Surya Junior Singer earned Sreya Jayadeep a chance to sing in a movie titled Weeping Boy. In this movie, she had sung two songs, one Chema Chema Chemanoru and the other Thaaraattupattum. This film was directed by newcomer Felix Joseph. The debutante director was aware of the risk he was taking. Hence, he decided to take the help of veteran actor, scriptwriter and comedian to bring some degree of acceptability amongst the audience. In this movie, young Sreya sang two beautiful songs that became instantly popular. Her songs in this film suddenly went viral in the social media. She started getting huge fan following for her maiden venture. Despite of her tender age, she sang the song at a level that reflected the maturity of a singer. This aspect did work wonders for her. After the success of her maiden venture, many music directors have started approaching her with the offers. Since she is very young, her parents wanted her to be choosy about the songs she would sing. According to her parents, this simple step would give her ample time to devote for her studies as well and keep her soul fresh and kicking. Sreya Jayadeep is a new singing sensation who has taken the tinsel town and the music industry by storm. She was interested in singing and music when she was a small child sitting on mother's laps. When she grew up, she started humming and singing at home whenever she was alone or feeling bored. Looking at the interest of the child in music, she was given formal training in music under the tutelage of an able guru. She started expressing her singing talent even at school. Because of this reason, both parents and teachers decided to send her application with a copy of her rendition to the organizers of a reality show during the audition. The organizers and the judges got impressed about her work and decided to give her a chance. She did not prove them wrong during the course of the competition. She stood in top-five list throughout the competition and earned the judges appreciations and laurels. Finally, she overcame the stage fear and came first in the competition, giving herself a well-deserved offer to sing songs in a movie titled Weeping Boy. There also she proved the music director that she is capable of singing songs of any genre. After the success of her maiden venture, she started getting a barrage of offers. However, she wanted to remain choosy to the offers, as she also wanted to continue her studies.